The Squad Stats web site is now LIVE! disposableHero started a topic [ANNOUNCEMENT] The Squad Stats web site is now LIVE! Several of us on the admin team have been hard at work since we first announced the Stats project a few weeks ago. We've put in a lot of time behind the scenes building the stats site. We feel it's in a good enough place to release the first version of it, but we're not stopping here. We have a lot more planned for this site that we'll be putting into place over the next few weeks and months. Our vision for this site is not just as a portal to view stats but as a major piece of our entire Squad community. We'll have more on this stuff later, but right now let's get to the site itself. Leaderboard - Who is the best of the best? Who plays medic the most? Who waits the longest for a medic to revive them? You can find out here. Players - We provide a list of all players that have played on our server with their stats. You are able to view any player's stats by selecting a player in the list. To help you find a specific player without cycling through page after page of data, we have provided the ability to search the player's database. Rounds - Rounds are the main data category. Each round provides data about the two factions that have fought that round, the map and layer for the round, statistics about logistics, healing information and even where deployables such as rally points, FOBs and HABs were placed on the map and by what team. Maps - We provide stats for each map, including faction win percentage, times played, and averages for kills, revives, etc. Factions - For Factions, we provide overall win %, average kills as well as a round history for each faction. Weapons and Vehicles - We provide a list of different kits, weapons, vehicles and time played for each. Your Stats - There is also a quick link in the menu to bring up your own stats. This is available if you log in to our site using your Steam account log in. This will let us find you in the database of players. 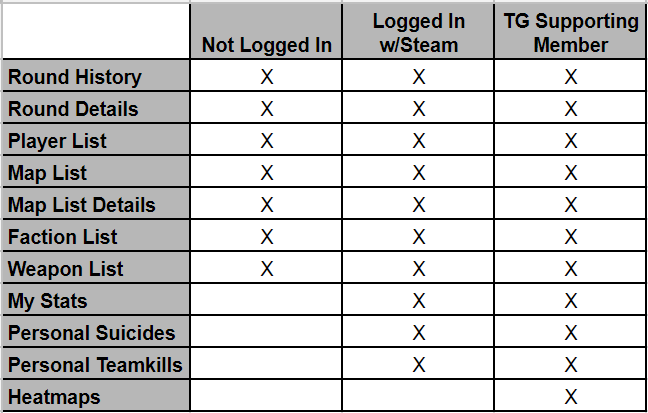 As was mentioned above, to be able to view some information you will be required to log in using you Steam account. If you do this, the only information that our system receives is your Steam64Id. No other account information is provided by using the Steam log in. Heatmaps are available for TG Supporting Members. If you are a SM, please make sure you log in to the site with your Steam information. We welcome feedback and suggestions of what you'd like to see. We do need to emphasize that there is some data that we just don't have access to, so as much as we'd like to, we can show everything. Feedback can be provided in this thread, using the Contact an Admin forum as well as in our Discord in the #stat-tracker-discussion channel. Lastly, this is obviously still under development. You should expect things to be a bit quirky at times and maybe even a bug or two might show up. If you see something wrong or experience a bug, make sure to let us know.